Subject: First Play. Last moment. Finally had a chance to play my first game. I love it!!!! 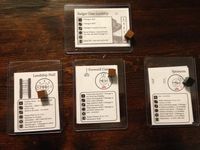 I found myself unexpectedly bogged down repairing my hull and cannon because I was certain one more turn of rolling all three dice and I would drop the enemy lines to either 3 or 2 cards. Meanwhile they kept peppering away at me - except the light artillery, thankfully the crew had decided to try shooting with their eyes closed for the day! All of a sudden I rolled where I had to eliminate the cards and the Final Battle was on! I made it to the end. My hull was down to 1 point. The enemy down to 1 cBadger Landship with 2 points and I had 3 cards on my frontline! I had it made. That Badger rolled 1 damage to hull. And like that it was over. And I loved it! What a great game!! Well done! Thank you for sharing this. (I should also mention that since moving to Wisconsin - home of the Badgers - from NY I may have spent my time bad mouthing the cheese here as compared to NY and VT :/ So it was probably fitting I was finished by a Badger. Sounds like a good game! Keep in mind that once you are in the Final Battle, neither the player nor the enemy can do repairs. Thanks for playing and for the very nice write-up. As a designer, your compliments (bolded above) are great to hear. I design a game because I think it will be interesting, but I never know if it will click with other people. So, when it does click, and leads someone to use all those exclamation points, it's a great feeling. So, thanks. And yes, you do not want to mess with Bucky Badger. As for your Repair - 1 Damage - Repair roll, I was a little confused by that too. Based on your earlier comments it sounds like you know you can't repair during the Final Battle. Did you just mean you had 2 sort of wasted dice in the roll? Seriously, hopefully people will read this session report of yours, but when people are searching for games, sometimes they filter out games with not a lot of ratings, so I'm just trying to make sure this game can get on people's radar. Thanks! Keep in mind that once you are in the Final Battle, neither the player nor the enemy can do repairs. Yeah that was the rub! No repairs - 2 lost die rolls!!! AHHHH. Then Boom. Yeah that is exactly what happened! I had tried to delay the loss of the enemy for a turn or two - even voluntarily getting stuck in the mud - just to try and make some repairs before I lost enough enemies (or my sponsons) to prevent any more repairs.